The construction set Coaster (コースター) is one of the sets in the Nintendo N&B Block series. With this set, you build your own tumbling bean racing game. 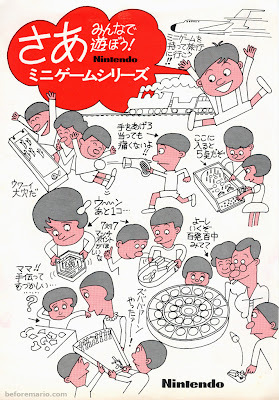 N&B Block Coaster was released in 1968 and cost ¥1,200. When I started this blog, I did not image it would attract a lot of visitors. I hoped it would reach fellow enthusiasts, but did not expect there would be many out there. 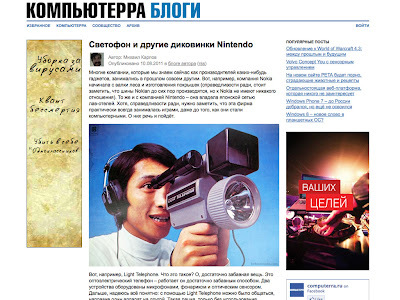 Although Nintendo is a popular brand, there are zillions of sites and blogs already dedicated to it. I believed the particular angle I choose (toys and games from 1965-1983) would be of limited interest in this videogame day and age. We passed the 50,000 blog view mark today! However, 7 months and 43 posts later, the page counter passed the 50,000 views mark. Surpassing my expectations by far! From the start there has been a steady increase in the number of readers. 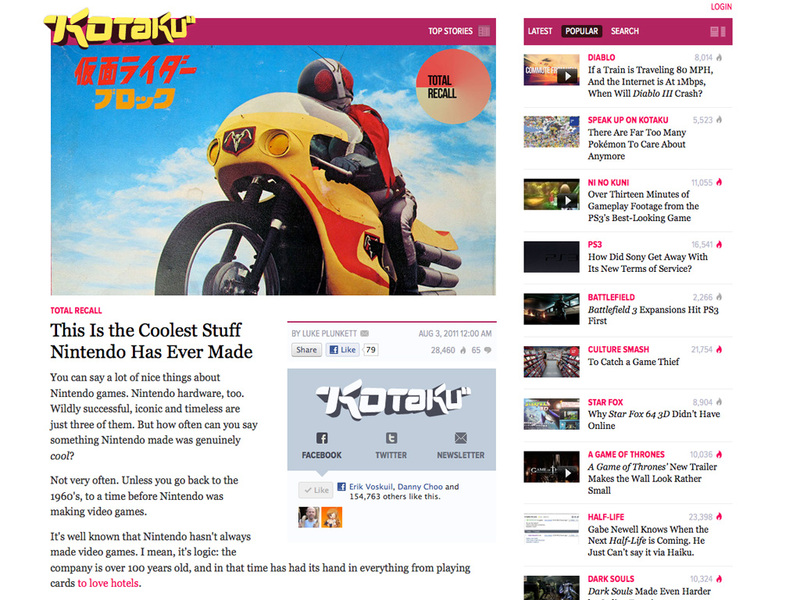 After beforemario was featured on Kotaku some time ago, this increased even more. 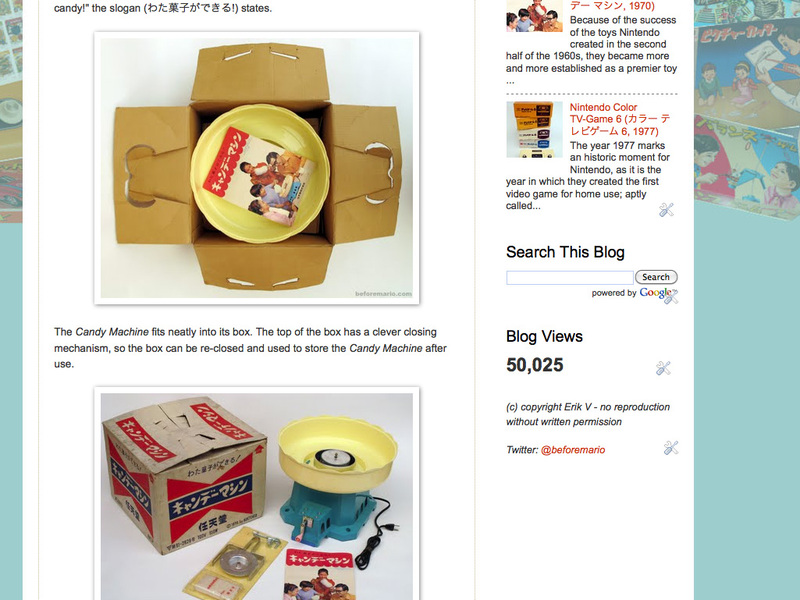 The post on the Nintendo Light Telephone also proved very popular. It was reposted on many sites, including retrothing.com and sites from Germany (here and here), Spain (here) and Russia (here). The blog draws a diverse readership from all corners of the world. To all of you I would like to say: thanks for reading! I would also love to hear your feedback about the blog so far. What do you like, what can be improved. What's your favorite bit and what are you missing? Do you read it occasionally, or religiously? So, what do you think? Please post your comments below. Thanks! 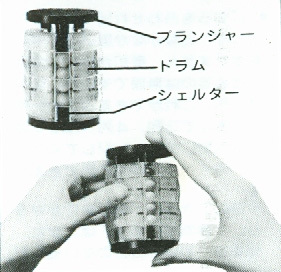 In 1980 Nintendo released a toy that would become a hit in their Japanese home market as well as abroad. Some of Nintendo's toys and early arcade games had been sold internationally before, but noting on the scale of Ten Billion. The Ten Billion (テンビリオン) is a 3D puzzle (立体パズル). It was a response to the phenomenally poplar Rubik's Cube, which Nintendo's great inventor Gunpei Yokoi used as inspiration to come up with his own original puzzle. It was not their first 3D puzzle. Many years earlier, Nintendo had already released Fifteengame and the Challenge Dice, both much simpler puzzles. The Ten Billion came in a plastic case, and was sold for ¥1,000. The top of the case contained a gold colored sticker with a "N", obviously referring to Nintendo. 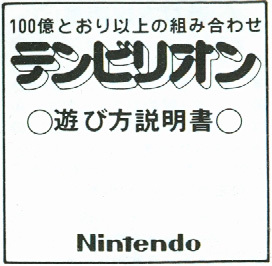 The Nintendo name was also included in the top and bottom of the game itself. The Ten Billion barrel is filled with 23 balls: four balls for each of the five colors (yellow, orange, red, blue and green) and 3 black balls. 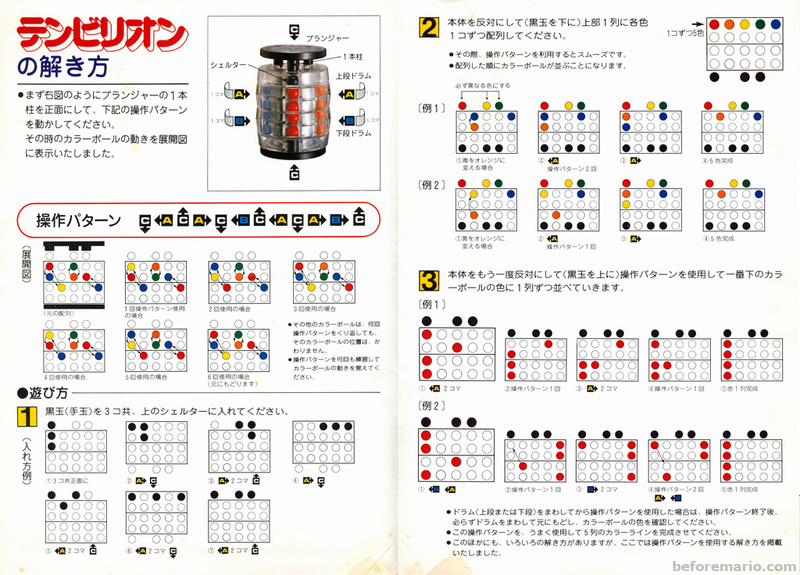 The objective of the Ten Billion puzzle is to get all balls back into their original spot inside the barrel, after they have been thoroughly mixed by rotating the two drums (ドラム) in the middle of the barrel while moving the black plunger (プランジャ) up and down. The Ten Billion owes its name to the 10 billion (10,000,000,000) different permutations in which the balls supposedly can be mixed. When counted properly, the number of permutations is actually around 450 times higher (4,509,264,634,875). The two middle sections of the barrel can be rotated independently, which moves ten balls at the same time. The black plunger has three protruding pieces pushing against the balls. When the plunger is moved, three of the five columns move with it (moving a total of no less that 15 balls at once). If you compare the image above with the one below, you notice that the column in the middle (with the two yellow balls and one orange and blue ball) did not change when the plunger was moved to the right, while the other two columns moved to the right with it. Because of the large number of balls that move at the same time, solving this puzzle is very tricky. 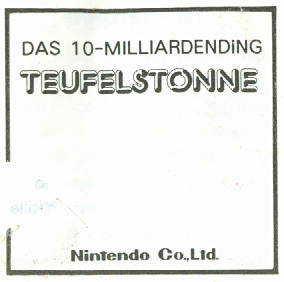 Nintendo provided to retailers a leaflet (解説書) with information on solving the Ten Billion. 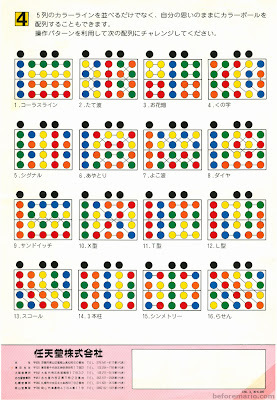 The leaflet shows step by step how to solve the puzzle, starting by moving the three black balls into the correct position, and then moving the colored balls in their right column, one column at a time. 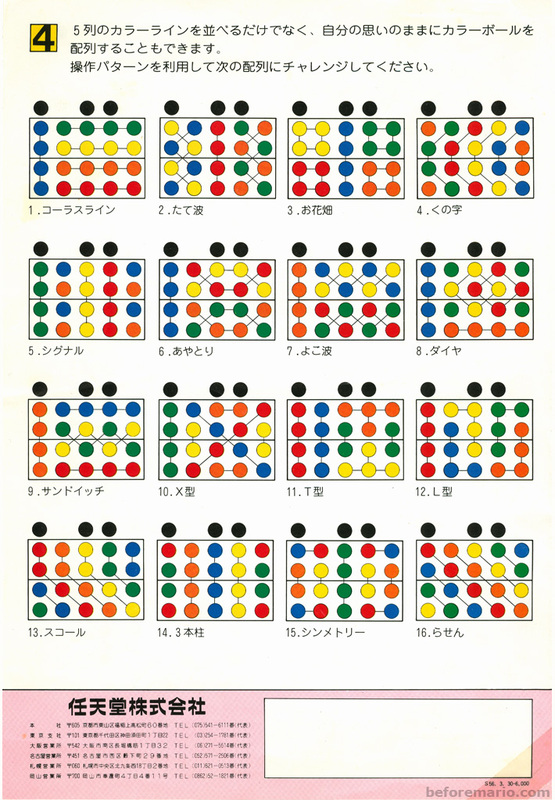 For people not content with "just" aligning the balls in their original configuration, a final section in the leaflet provided sixteen additional challenges with various nice patterns for the colored balls. As mentioned, the Ten Billion was an international success and exported to many countries around the world. 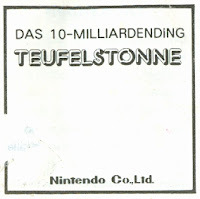 German edition of Ten Billion, called "Teufelstonne"
In Germany and The Netherlands Ten Billion was sold under the name "Devil's Barrel" ("Teufelstonne" and "Duivelston", respectively). In the United Kingdom, it was distributed by a company called CGL, which also distributed Nintendo Game & Watch games. For many people in the West, including me, Ten Billion was the first exposure to Nintendo's ingenuity. It was a serious brain twister with a high quality design. At the time, though, not many will have recognized and remembered the Nintendo brand name, as it was still very much unknown outside of Japan. Of course, that would change very soon thereafter; an ape-centered video game and an avalanche of Game & Watch games made sure of that. But that is a different story. Nintendo did create a follow-up to the Ten Billion: the Crossover. An equality interesting puzzle, but commercially much less successful. The Nintendo Mini Game Series was very popular in the 70s. But Nintendo stopped selling them in the later half of the 70s, when they abandoned the production of more traditional toys, so they could focus fully on video games for the arcade and home. This was not the end of the Mini Games though, as Japanese company Nichiten Co. Ltd. (ニチテン) acquired a license from Nintendo to produce these games. 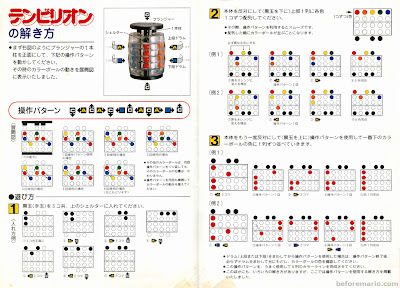 (In more recent years Nichiten also acquired a license to produce a remake of the Nintendo Ultra Machine DX). The Mini Game versions by Nichiten are very close to the Nintendo originals. Some colors differ, as did some of the artwork. The names of the games were sometimes also changed. For instance, the Bee Hive Game (ハチの巣ゲーム) became Block Dropping Game (ブロックおとしゲーム). Instead of blister packs, the games were sold by Nichiten in plastic bags. 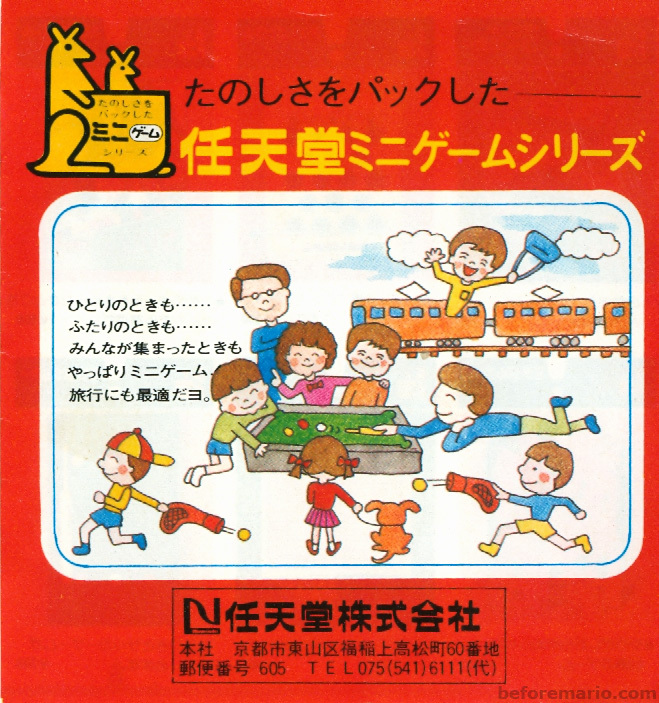 The tagline was appropriately changed to "fun bags" (楽しさバッグン). The Kangaroo, which had been Nintendo's brand logo for the Mini Games, was replaced by a cute baby elephant, holding a sign with the word "mini" (ミニ). The instructions are integrated in the back of the games. The leaflets below shows the range of games included in the Nichiten Mini Game Series. According to these leaflet, the range included at least thirteen games licensed from Nintendo, as well as some other games added by Nichiten. Judging on their rarity these days, the Nichiten range was sold in much lower qualities than the Nintendo originals. In the years following the second World War, lack of raw materials and a general struggle for survival meant that toys were a luxury which few could afford, and even then mostly at special occasions only. Twenty years on, things were looking quite different. The post-war economic miracle was raising the standard of living for most in Japan. The country was on a trajectory that would lift it to second largest economy in the world (a position only recently lost to China). People had increasing funds for non-essentials, and children - of which there were many as a result of a baby boom - had more pocket money to spend. Because of this, from the mid 1960s onwards, toys were being bought much more frequently; getting a new toy had become part of regular leisure time. 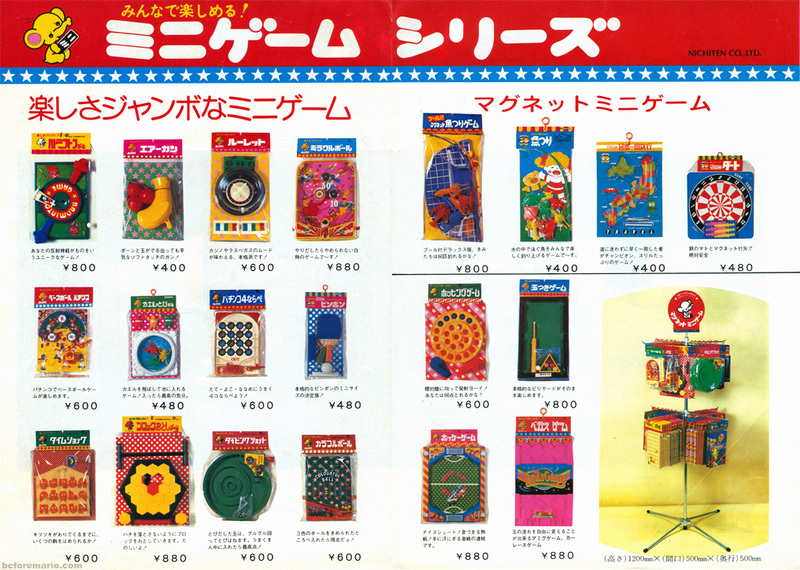 The Nintendo Mini Game Series (ミニゲームシリーズ) was a range of toys that catered for this fast expanding market of simple, not so expensive, plastic toys. The first games in the Mini Game Series were introduced around 1971-72, and new toys were added to the series until 1976. The games were priced between ¥300 and ¥900, depending on their size and complexity. Although not cheap, they were affordable and the high manufacturing quality of the games also warranted these prices. The Mini Game Series had a recognizable kangaroo icon as it's brand logo, with the word "Mini" (ミニ) on its pouch. The tag line for the range was "packed fun" (楽しさをパックした). Nintendo wasn't the only company producing these kind of games, and they also weren't the first. Their main competitor was Japanese toy giant Epoch, who had started their own Mini Game series around five years earlier. Nintendo followed suit and copied the packaging and some of the themes of the games (as did many others), but also added a lot of original ideas. In terms of sales, Nintendo and Epoch were both very successful with these toys, as the market was big enough for multiple players. All Mini Games were sold in blister packs with a plastic transparent front and a cardboard back. The Nintendo Mini Games came with a white plastic hook, by which they could be hung for display at points of sale. The Mini Games were sold at various types of locations, including toy shops, news stands and petrol stations. You could also find these Mini Games in the so-called Dagashi-ya (駄菓子屋), the small candy stores of which there were many all around Japan. Not many are left these days, but every neighborhood used to have at least one, which functioned as the local hangout for children. 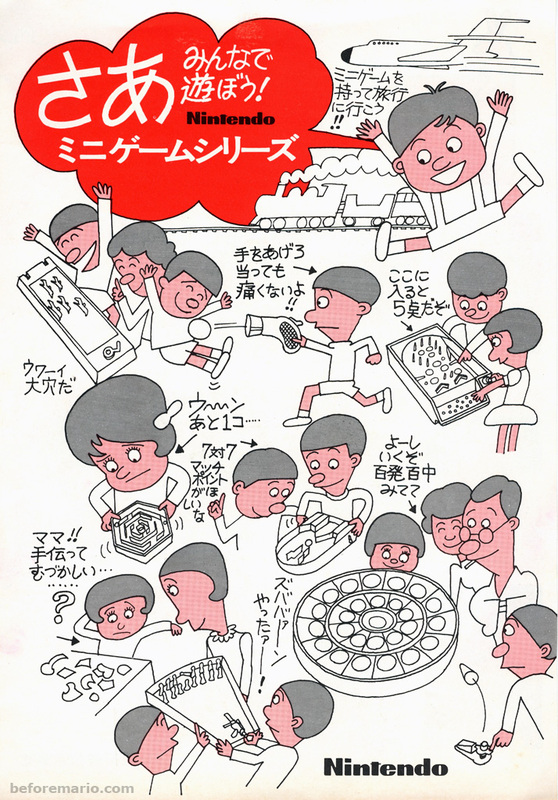 In the 60s and 70s, travel in Japan was booming and these games also provided ideal diversion on the go (on trains, planes and automobiles), as illustrated on this 1972 flyer. "Yes! All play together" (さあ みんなで 遊ぼう) shouts the little boy below. The Nintendo Mini Games came in two distinct sizes: the large packs were around 22 by 30 centimeters and the smaller packs around 19 by 26 centimeters. The cardboard back of the blister pack was brightly colored and featured busy, almost psychedelic scenes (very much 70s style); all aimed at standing out in the shops and catching the eye of the little customers. Instructions on how to play the game were always provided on the back. A couple of years after the launch of the Mini Game Series, the packaging was redesigned. Gone were the busy drawings, replaced by a less exciting but more standardized look. The packaging of all games now had the same design: a pattern of the familiar kangaroo against a red, green, yellow or blue background. This new design may have saved some design cost over the previous packaging (which required unique drawings for every game), but, more importantly, it made the games much more recognizable as part of the Nintendo Mini Game series, by now an established brand. As part of the redesign, the kangaroo logo was also slightly modified: a baby kangaroo peeping out of its mother's pouch was added, and the kangaroos were given eyes. A number of the games that had been available in the original package design were released again in the new design, while a set of new games was also added around this time. To further boost sales, from 1974 onwards most of the Mini Games came with a mini brochure. This brochure showed the range of Mini Games for sale at the time. The games in the Nintendo Mini Game Series can roughly be divided in four categories. The first category consists of miniature versions of traditional games like chess, roulette and billiards. The second category contains all sorts of dexterity games that involve metal ball bearings. The third group are portable versions of Nintendo games previously released in full size; like Time Shock, Hockey Game, Hopping Game and Rabbit Coaster. The fourth category we will simply call "other". It consists of a wide variety of original games that do not fall in any of the previous three categories. A Nintendo logo and copyright notice can be found on most Mini Games, usually on the back. The picture below shows the copyright notice (1976) of one of the last entries in the Nintendo Mini Game Series: a game called Sky Ring. To respond to fierce competition and keep customers interested in buying Mini Games, it was necessary to regularly introduce new games. Over the lifespan of the Nintendo Mini Game Series, at least fifty different games were released (not counting color or package variants of the same game). For a list of all games go to the Nintendo Mini Game Series overview. After Nintendo stopped selling the Mini Games, fellow Japanese toy maker Nichiten acquired a license to produce remakes of a number of these games.